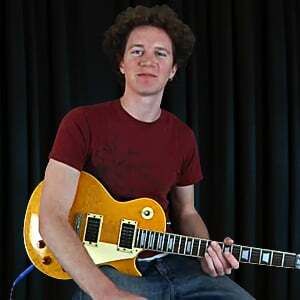 In this tutorial, Mike Olekshy will teach "More Than A Feeling", as made famous by Boston. Mike will teach all 5 guitar layers in this tutorial. A 12 string acoustic kicks off the song with an iconic arpeggiated riff that appears in all the verse sections. A clean electric guitar adds some ringing harmonics and arpeggiated chords. A crunch guitar sets the chorus sections on fire, and two additional lead guitars add some melodic harmonized leads. All of these guitars appear throughout the tune creating a rich tapestry of sound that became an industry standard of how to multi-layer guitars in the studio. Mike will show your both guitar layers. Guitar 1 is the rhythm guitar tuned to open G that gives the song its distinctive country flavored sound. Guitar 2 is the lead guitar that adds some exciting solo blending major and minor pentatonic sounds, combining rock and country flavors into to the arrangement. In this group of lessons we'll be learning the classic party hit "Takin' Care Of Business", by Bachman-Turner Overdrive. We'll look at the main riff which is such a classic guitar hook, the gear and tone, the rhythm guitar parts, the song form, the solos, the breakdowns, and the jam outro. Then we'll take of business and play it all through with our custom backing track. Dave will show you the three guitar layers in this song, from the laidback rhythm guitar clean tone, to second guitar lower in the mix holding chords longer with few rhythm embellishments, to the third using a whammy bar and grungy overdrive for the solo. In these ten lessons, Henrik Linde will teach an acoustic strumming version of "California Dreamin'", by The Mamas and the Papas. 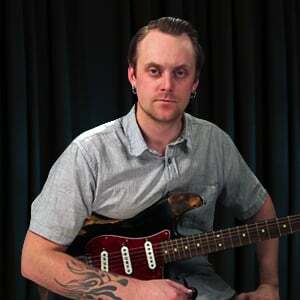 After an overview and talking about the tones, Henrik will teach the song intro chords and counter melody. Next up are the verse and chorus chords and strumming, and the 12 string licks. To follow, we'll look at the part played under the flute solo, and then the outro "tag". Last up are the play along and jam along. Mike will show you all the rocking parts of this Stones classic. Both guitar layers: the rhythm guitar that combines plucking and picking to give the tune its distinctive sound and the lead guitar that adds another layer of drama with some bluesy-rock based licks. 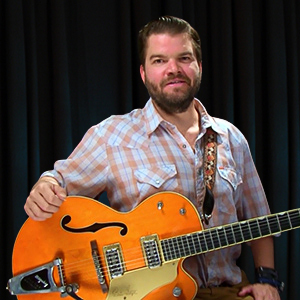 In this series of lessons, Geoff Earley takes you through all the different parts for the gritty, rockin' song "Are You Gonna Be My Girl" by Jet. We'll break down the hook riff of the tune, the call and response format, the pre-chorus, the minimal chorus, the tone and vibe, some of the other licks used, and of course a play through at the end.